Veeam Backup & Replication checks the Tape Catalog in the Veeam Backup & Replication database to discover the tapes containing the needed restore point of the files. If the tapes are offline, Veeam Backup & Replication prompts the user to insert the required tapes. 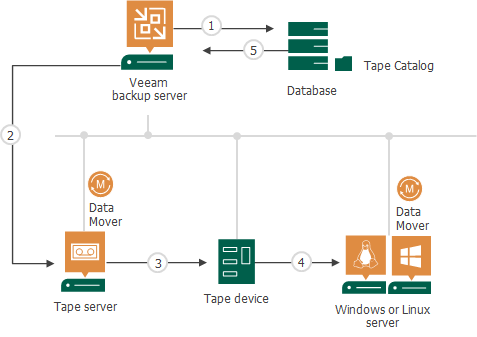 Veeam Backup & Replication connects to the Data Mover service deployed on a tape server. Veeam Backup & Replication updates the Tape Catalog in the Veeam Backup database.